I've taken the ps pump off and on a few M62. They were not in the X5 but I bet it's similar. There is one near impossible to remove 13 mm bolt/nut on the back side attaching to the back of the alternator I believe. Using a through-hole socket turned out to be the spot on perfect offset. A low-profile socket may also work or a box end with offset end. I had the alternator out when I did the ps but I don't think it would matter. Find a YouTube video or repair manual steps. Last edited by Ryoken; 01-05-2019 at 04:17 AM. There is a pic of the back nut. There is only about 1/4" of space behind the ratchet. This was on either 5 series or 7 series but directly from below not wheel well. You won't see anything with the stiffening plate on but should see similar with It off. I never took the pump out of the engine bay just out of the way to remove timing chain covers but I think there is enough room with the fan and shroud removed to get it out the front. 11 minutes in shows the tricky nut. 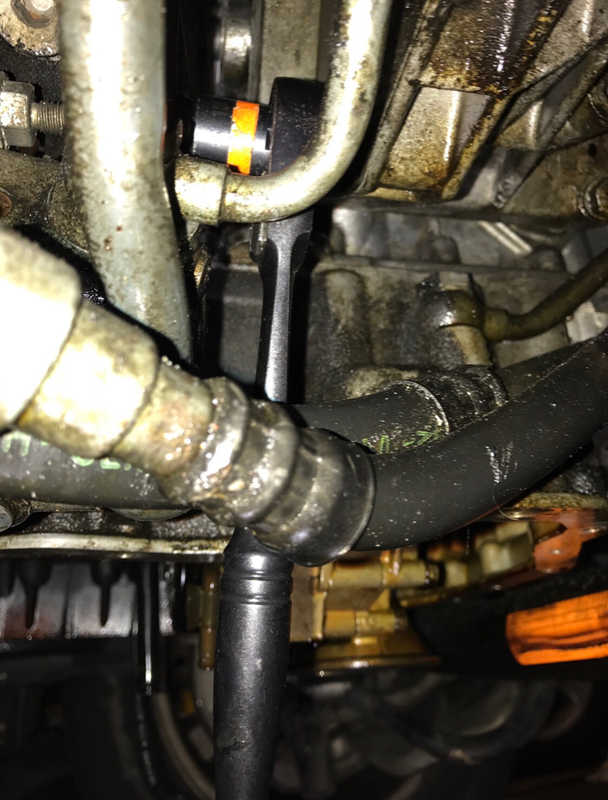 The right tool will work without removing the fittings for the hoses. If replacing re he pump anyhow, not sure if it matters. I flipped my bolts for the stiffening plate last time I had it off. Much easier to Install with the nut on the bottom. Last edited by andrewwynn; 01-06-2019 at 05:47 AM. Bought one on ebay for 100€, came brand new but had to reuse the pulley, no manufacturer listed but its done a few thousand kilometers and works perfectly. I did not remove the stiffening plate, juste the front plastic tray. I did loosen the U metalic hose from the steering rack to gain perfect access even though its tight. The pump comes out from the bottom where the plastic tray sits. all in, around an hour. Great feedback. The cars I worked on didn't have the stiffen plate so I wasn't sure if needed to be replaced. This tool might work to adapt a straight ratcheting wrench to a low profile ratchet and also be an option. I used this set which I coincidentally keep under my passenger seat. Extremely useful set only downfall is no extensions so I bought a couple. If you read the reviews you'll see complaints about no 16mm. There is it's just called 5/8". Strangely not mentioned or labeled as such. My impact socket set has the dual sizes labeled as such eg 3/4" = 19mm. There are about 4-5 common 1/16th sizes that match with metric. 7/8 =22mm another example.